Blank warrants were issued, and filled up occasionally with such names as the informers suggested. These were delivered to Aaron Smith, solicitor to the treasury, who, with messengers, accompanied Lunt and his associates to Lancashire, under the protection of a party of Dutch horse guards, commanded by one Captain Baker. They were empowered to break open houses, seize papers, and apprehend persons, according to their pleasure; and they committed many acts of violence and oppressions [FN1]. 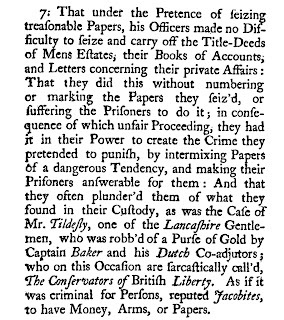 ...under the Pretence of feizing treafonable Papers, his Officers made no Difficulty to feize and carry off the Title-Deeds of Mens Eftates; their Books of Accounts, and Letters concerning their private Affairs: That they did this without numbering or marking the Papers they feiz'd, or fuffering the Prifoners to do it; in confequence of which unfair Proceeding, they had jt in their Power to create the Crime they pretended to punifh, by intermixing Papers of a dangerous Tendency, and making their Prifoners anfwerable for them: And that they often plunder'd them of what they found in their Cuftody, as was the Cafe of Mr. Tildefly, one of the Lancafhire Gentlemen, who was robb'd of a Purfe of Gold by Captain Baker and his Dutch Co-adjutors; who on this Occafion are farcaftically call'd, The Confervators of Britifh Liberty. As if it Was criminal for Perfons, reputed Jacobites, to have Money, Arms, or Papers [FN3]. 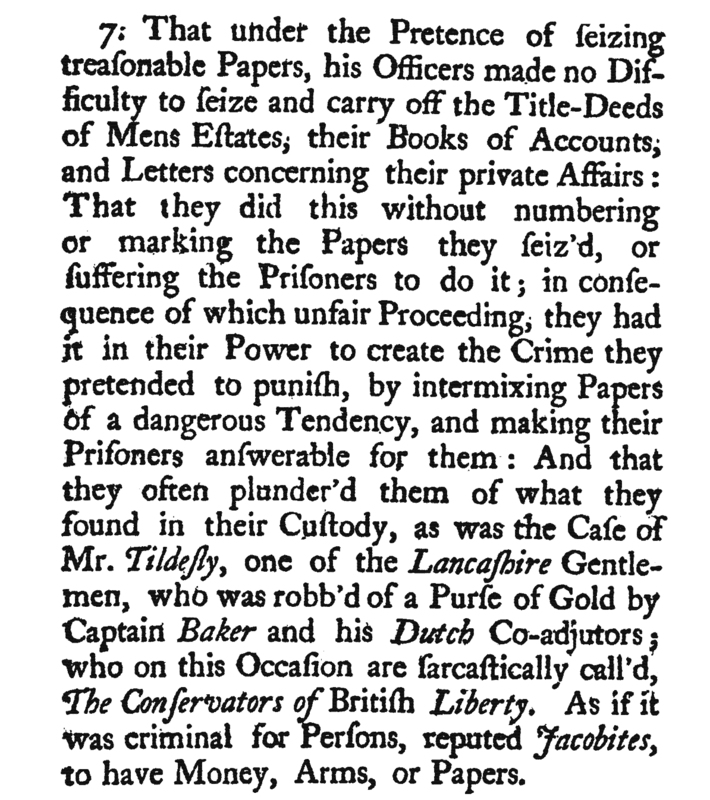 As seen in an earlier posting, the investigation led to a farcical trial at Manchester in 1694, in which all the defendants were acquitted. No charges were brought against Thomas Tyldesley. Sir John Trenchard died the following year on 27 April 1695.